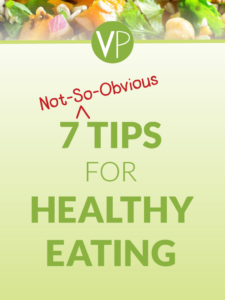 A big salad can be a healthy meal unless you smother it with an oily dressing. 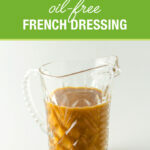 This Homemade Oil-Free French Dressing is just as tasty as store-bought, but it’s made with simple, healthy ingredients. 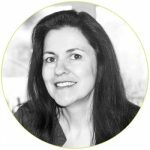 I limit processed oils for a few reasons. Most of the folks who have influenced my approach to eating recommend a low-fat plant-based diet – especially for preventing or treating heart disease. These same folks, and others, express concerns about the impact processed vegetable and seed oils have on our health. 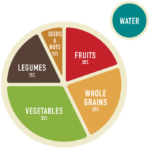 While some folks in the health industry tout the benefits of olive oil, I prefer my daily intake of fat come from whole foods. In other words, I’d rather eat the olive than the oil. In the spirit of full disclosure I must admit I have a supply of the afore-mentioned store-bought organic gluten-free French dressing in my pantry. My daughter does not care for the quick balsamic mustard dressing I usually make. The guilt and concern I experience every time I watch her smother her salad in the oily dressing is what inspired me to develop this recipe. I conducted a side-by-side taste test with my daughter. She agreed the flavor of the two dressings is comparable. 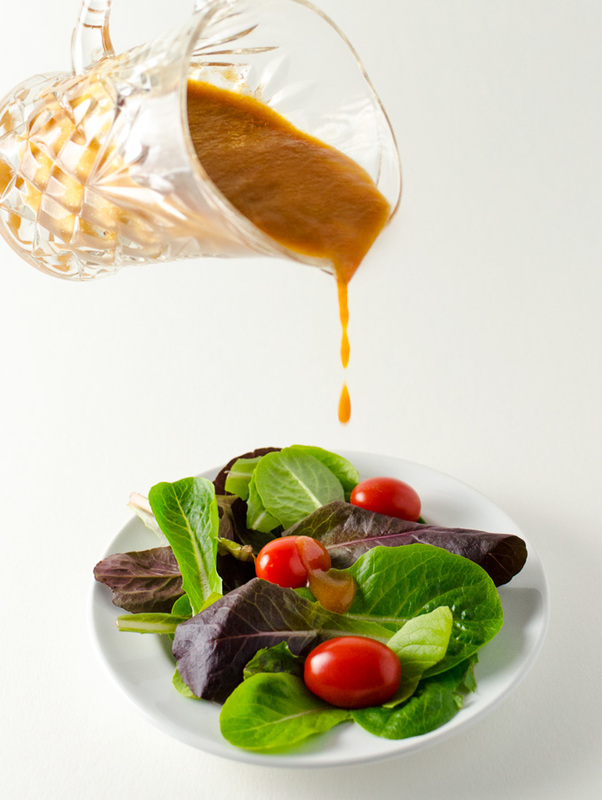 The Homemade Oil-Free French Dressing has just the right mix of tangy sweetness with a hint of tomato and celery. I envision a bright future with at least one less cause for mother guilt! 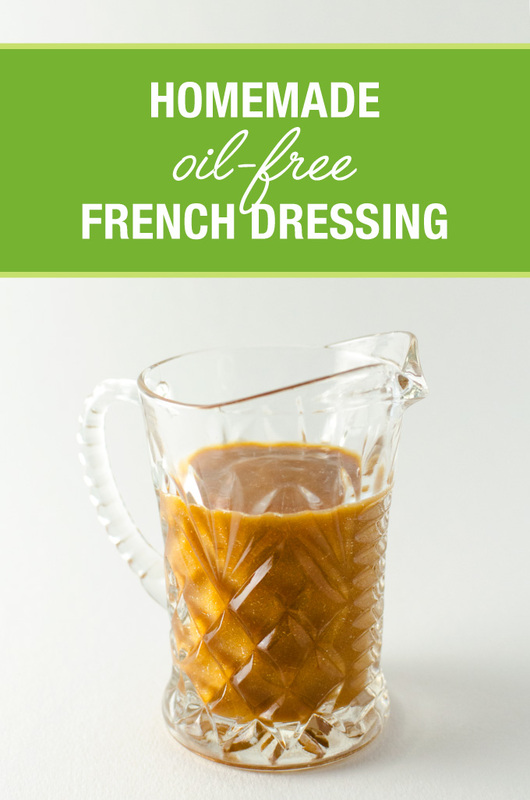 This homemade oil-free french dressing is just as tasty as full-fat store-bought, but it's made with simple, healthy ingredients. 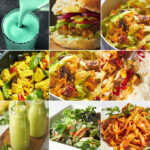 Add ingredients to a high-speed blender in the order they are listed. Begin blending on lowest setting and increase speed to highest setting. Blend on high for approximately 30 seconds. 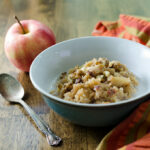 Scrape sides with a spatula and blend again for another 20 seconds or until dressing is smooth. Chill in refrigerator before use. Store in a sealed container for up to one week. Recipe makes approximately 1 cup of dressing. this sounds interesting…pinning it to try! Thanks Suzy. Let me know how you like it! 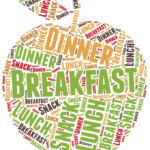 Just made this replacing the dates with maple syrup as I didn’t have any, and the tomato paste with Ketchup. Tasted great! Still a little thin, but I think the chai seeds just need some time in the fridge to thicken it up. I’m very picky when it comes to dressing but this is definitely a keeper! Thanks for developing such a delicious, easy, fat-free vegan dressing! Wow. This was a huge success! I’m new to the vegan (no added oils) lifestyle and I’m so relieved to know there are things like this I can replace my beloved Catalina dressing with! We’ve always used that on taco salad. (If you haven’t tried that it’s really good!) I don’t feel deprived at all and I’m picky so don’t be afraid to try this! So happy! Thank you for such a perfect recipe!